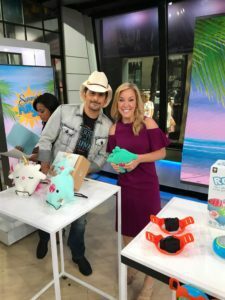 When the Today Show calls and wants to know “what’s new and fun for families” in my world, I scour the planet looking for genius new gadgets. 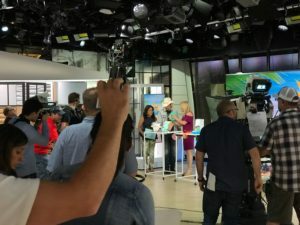 Typically, prices need to be under $100 for gadgets we show off during these segments, but occasionally, they’ll let me sneak in one “splurge” idea too. After submitting about 40-different ideas, here are the top seven we showed off on Today. 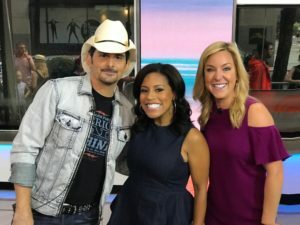 (With guest host, Brad Paisley, y’all!) Can’t wait to show you what we have “cooking” next! High-tech walkie-talkie + interactive plushie that lets kids communicate with approved friends and family, safely and securely. It’s a great way to get them to wake up, come down for school on time, and connect or chat with your child right from work. Adults can reply back directly from the free Toymail app and kids can talk toy-to-toy too. ROXs is an interactive game system that uses technology and digital gaming concepts – the two elements that make kids stick in front of screens – to get them to run, move and jump, unplugged. It’s like playing Super Mario in your backyard. The cool thing about ROXs is that kids can use their imagination to set up their own game rules. The pace of the game can be set according to the player’s skills by adjusting the distance. It’s great for both indoor play and outdoor play, and can accommodate up to 50 different player profiles at one time. The ultimate dream, Galactic Civil War-era ride-on in convenient toy form is available now for preorder, for a September 5 launch date (oh hai, early holiday shopping!). And I’d say do it. Because I think a whoooole lot of kids will have this at the very top of their holiday wish lists this year. The cruiser speeds along at 5 mph driving speed, makes real movie sounds, goes in reverse … For ages 4+, max weight 130 lb. The TRONO Chair is a super comfy, lightweight, easy to carry lounge chair which easily inflates within seconds by waving it around in the air. It’s a much better alternative to lawn chairs or folding chairs, weighs just 1.7 pounds and packs up small enough to carry in a purse, tuck in a backpack, store on a shelf or in a slide in a drawer. It holds up to 330lbs. The TRONO Chair comes in five different colors and includes an interchangeable suede cover. This is the personalized carryall that has all the essentials a family needs for an afternoon at the beach. 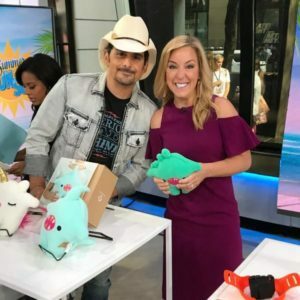 It comes with a removable soft cooler that stows drinks and snacks, four buckets for sand castle sculpting, and two 24″ L shovels for carving moats or discovering buried treasures. The shovels secure to the side of the tote and four external pockets provide storage for a tablet, sunglasses, sunblock, or other beach essentials. 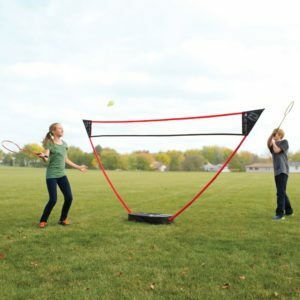 This is the freestanding badminton set that instantly creates a court on a lawn, driveway, beach, or any flat surface. Requiring no tools for setup, the PVC net support extends from its carrying case/base and the nylon net simply slips on to create a regulation-height 11 1/2′ wide court. The net comes apart as easily as it assembles and all components store neatly in the zippered nylon carrying case. Includes four rackets and two high-visibility shuttlecocks. For up to four players ages 8 and up. 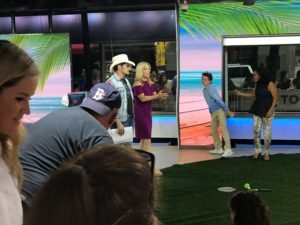 Here’s a link to watch today’s full video from The Today Show, and some more snapshots from today’s fun!